ARE YOU FULFILLING YOUR DESTINY? The language of astrology is made up of specific symbols that align themselves with multiple planetary energies. Your "Astrological Chart" is the blueprint of your life; like your fingerprint or your DNA, it is uniquely your own. The relationships that planets have with each other creates distinct alignments called Transits and Aspects. These alignments correspond with your Karmic patterns and can give you a keen insight into all aspects of your life. By interpreting these patterns and their planetary effects on your Birth Chart, one can achieve a greater self-awareness. 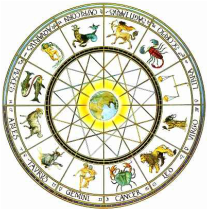 Receiving astrological counsel can uncover truths to your soul's destiny. Marci can help guide you through life's many winding paths. "Millionaires don't use astrology, Billionaires do!" "Marci Winters has been my ace in the hole for the last five years and I will continue to seek her guidance as I sail across the stormy seas of life. Whether you have personal or financial concerns, Marci can give you the foresight to plan accordingly; making sure that your ship always comes in. Marci Winters is a world class astrologer and I would highly recommend her service to anyone wishing to have a glimpse at things to come."